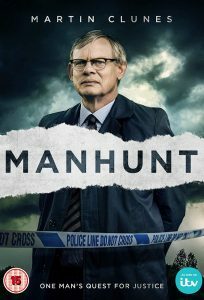 Martin Clunes from the Doc Martin series stars in Manhunt: One Man’s Quest for Justice. He portrays newly promoted DCI Colin Sutton who leads his first team to investigate the murder of a French woman named Amélie De La Grange who was staying in England for the past two months. Sutton also wrote the book on which this three-part series takes its influences from. All three episodes focus on the methodical work of Sutton and his team to figure out De La Grange’s movements. They go through CTV footage, interviews, forensic reports and similar crimes and more – looking for clues. Slowly Sutton and his team figure get a name of a suspect Levi Bellfield whose ex wife directs them toward. She tells the police in an interview that Levi hates women especially blonds, which De La Grange is. I liked the series except for the family scenes Sutton has with his profile wife and his daughter. I found it unnecessary to show and not engaging like the investigation itself and Sutton and his team’s methods. Also the mini series does not dramatize the murder itself, a second one being investigated nor an attempted murder that is also looked into in the series.